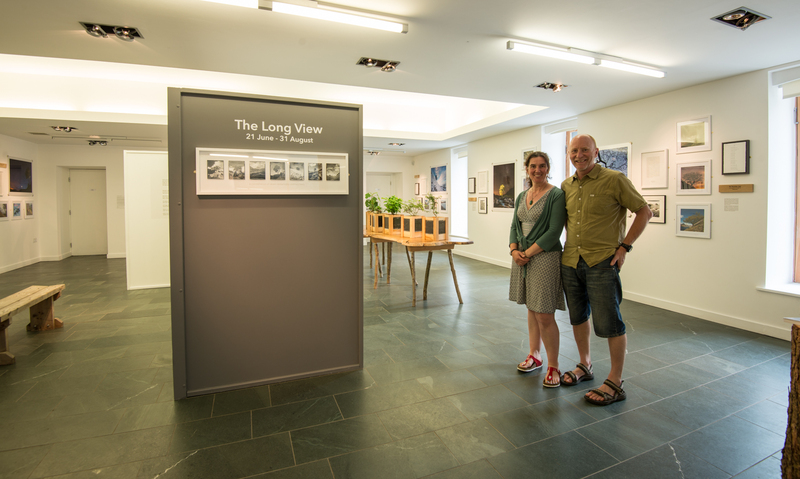 During the last month we haven’t been doing a lot of walking – most of our time has been taken up bringing work together for The Long View exhibition and at the weekend we celebrated its opening in the beautiful gallery of Grizedale Forest in Cumbria. What a perfect place to show work arising from two years with seven remarkably ordinary Cumbrian trees. 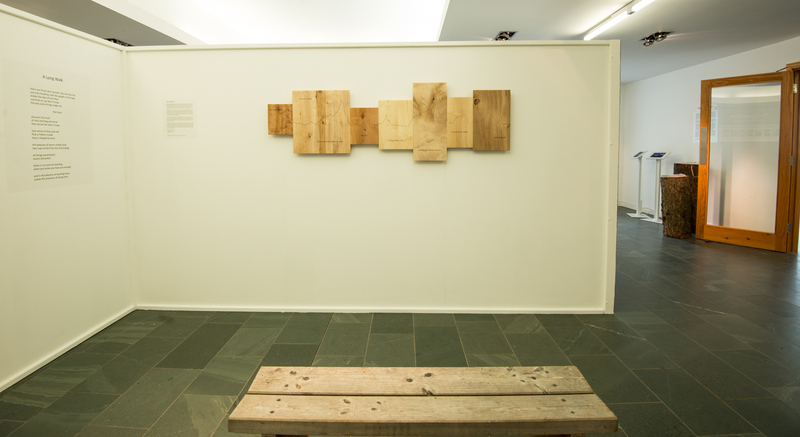 Grizedale is not only all about trees, it is also the UK’s birth place of land art, so it is a real privilege to be showing our work here. The exhibition features images and writing relating to each of the seven trees that we have collected during more than two years. Rob’s intimate black-and-white hand-printed photographs stand alongside full colour portraits of the trees, with a visual spread taking in every season as well as the trees lit up beneath star-filled skies. The trees are celebrated in poetry and prose, and some of my journal entries are on display. 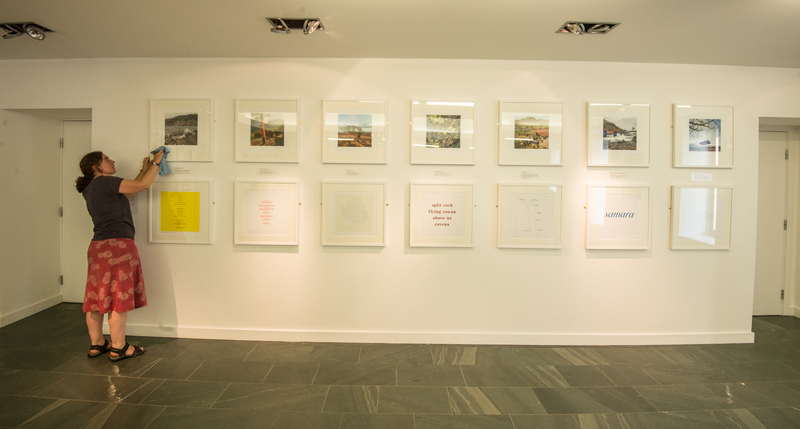 There’s an entire wall dedicated to the colour installations that we did at each tree, with photographic images of each installation and the poems from each, which were originally presented in the landscape, redesigned and screen printed. And the stars of the show? 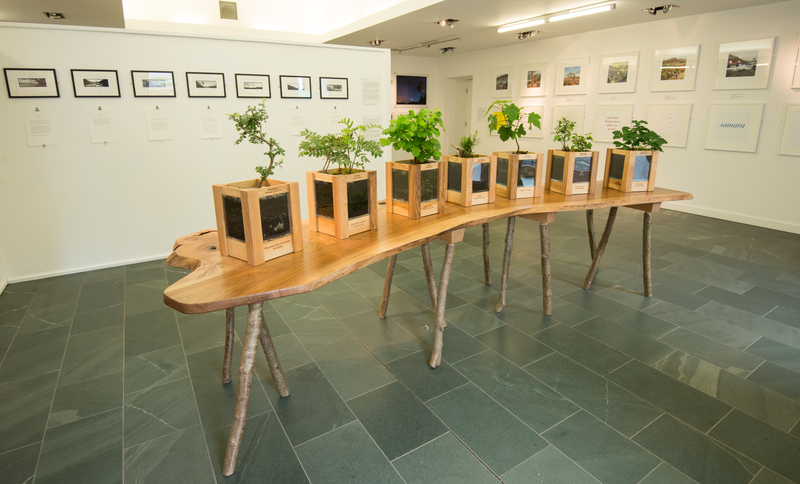 Real trees – seven small, carefully nurtured bonsai representatives of the trees we have been visited, each presented in an ash planter inscribed with poetry, and laid on a stunning piece of polished elm. We have loved the process of bringing all the pieces together. It’s funny – our individual crafts are writing and photography but during the last two years we have pushed beyond these. One of the pieces that has perhaps most surprised us is a 3D wooden piece comprising the wood types of each of the seven trees measured to reflect the distances we walked over seven days, and etched with the profile of the Light Walk, inscribed with poetry. If you’d like to head over to Grizedale Forest to see the exhibition it is open every day from 10am to 5pm, with the last day on October 10th. And if you do, we’d love to hear from you! Well done getting it all together it looks great I wish I could see it….does that mean there will be no more inspiring blogs ? We will keep posting blogs – we feel as if, having spent two years with these seven trees, we are only just starting. Our visits won’t be so frequent but there are a few other exciting tree-related things happening this summer. Watch this space! You can also follow our (slightly more occasional) blog at http://www.somewhere-nowhere.com.